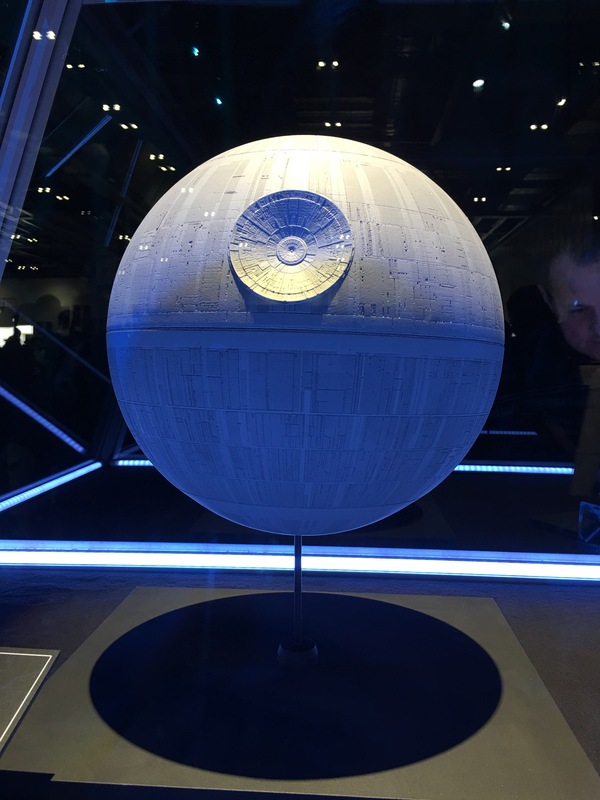 Star Wars Celebration Europe 2016 – Day 2 | Cinema, etc. Day two at the Star Wars Celebration was far more busy than the first. A sold out ticket allocation meant that queues were slightly longer, walking from A to B was slightly more stressful and events were slightly more over-subscribed. That didn’t really matter though. Because Star Wars. The day kicked off with the familiar dash for wristbands for the headline events in the Celebration Theatre. If you’ve never experienced this at a convention before, it is my understanding that this is about as mellow as it gets. You just need to be there on time and know what you’re looking for. 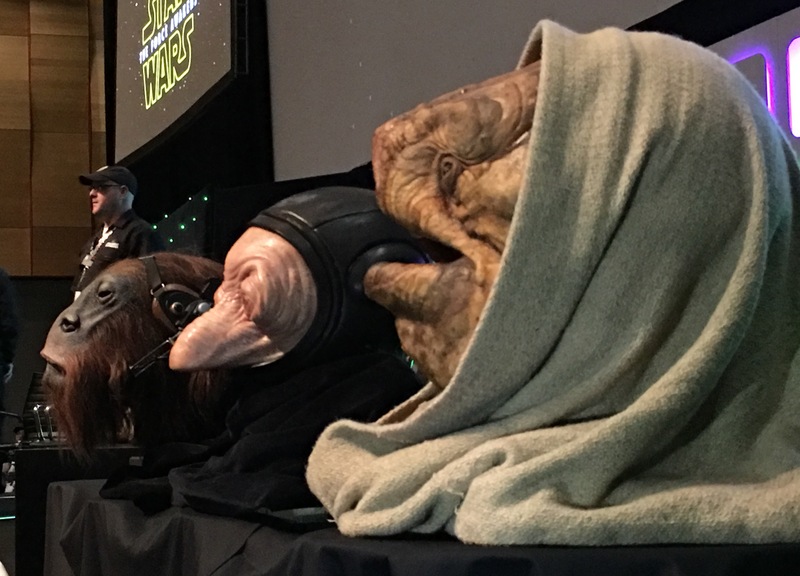 The first port of call was the panel discussion titled ‘The Creatures, Aliens and Droids of Star Wars: The Force Awakens’. Hosted by Warwick Davis (who acted as Wicket and Wollivan, amongst others), this was truly spectacular. Where else would you get a chance to hear an hour-long discussion with several members of the team behind the practical special effects in Episode VII? 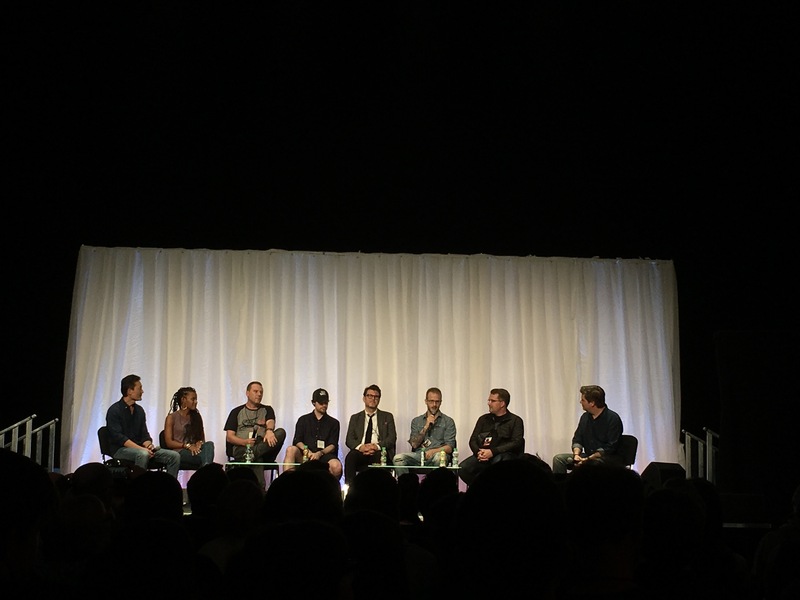 The panel included Neal Scanlan (Creature Effects Supervisor, Force Awakens); Brian Herring (BB-8 puppeteer, The Force Awakens); Vanessa Bastyan (Supervising Animatronic Designer); Chris Clarke (Animatronic Designer); Maria Cork, (Hair Department Supervisor). The key moment here was the reveal of a new character from Rogue One, provisionally called Space Monkey. Portrayed by Nick Hennings, he had a bit of fun misbehaving on stage and throwing some of Warwick Davis’s Ewok paraphernalia around. There was also demonstration of some Force Awakens characters, including Wollivan, Chancellor Villecham and Quiggold. The intricacy of the animatronics involved were easy to be missed in their blink-and-you’ll-miss-it appearances just didn’t do them justice. 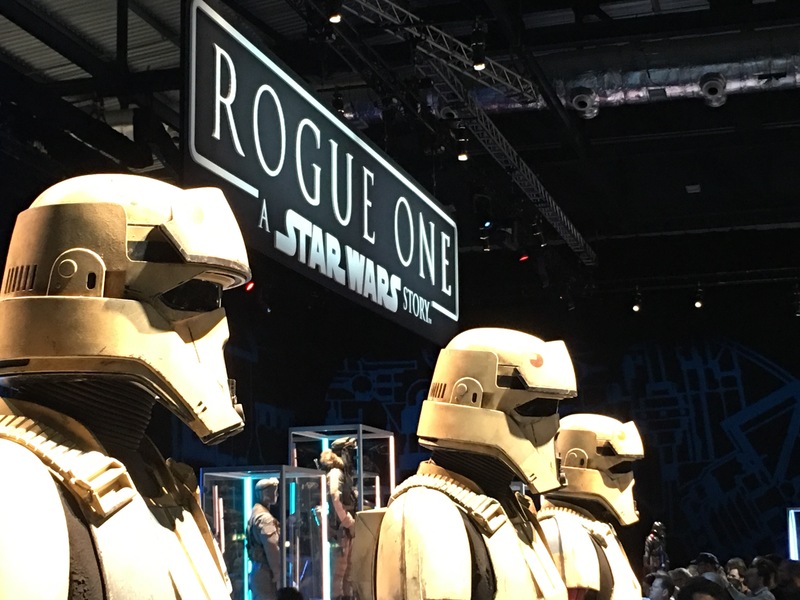 There is an exhibition all weekend featuring the costumes of Rogue One, which was fascinating for anyone keen to get more of a glimpse of the new film. The detail in the costumes is something missed when watching films anywhere but in a cinema so getting a chance to take my time with them was a unique experience that was only really afforded due to the close proximity of the venue to the recently-wrapped filming at nearby Pinewood Studios. ‘Anthony Daniels: Without Protocol’ was a wholly different and bizarre experience. 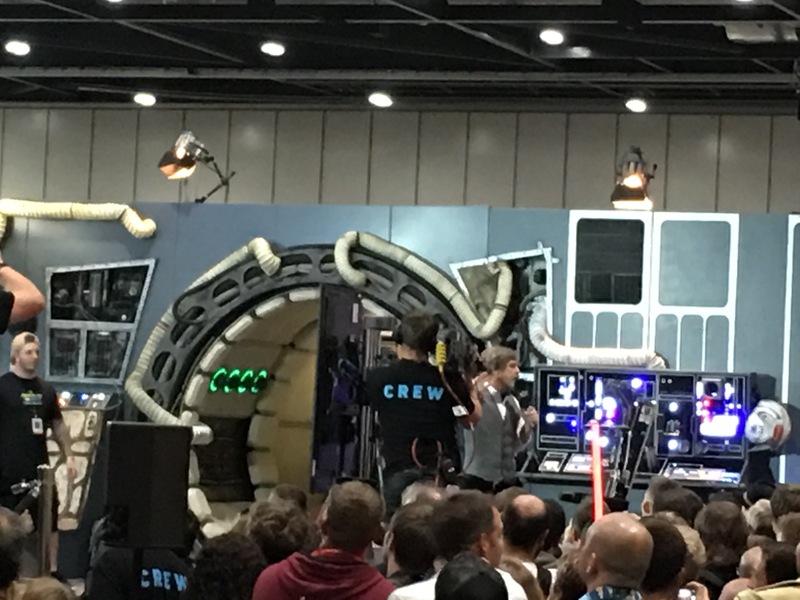 It started off like any other Q&A session before quickly descending into chaos, with Daniels and Warwick Davis trying to direct audience members on stage in a recreation of a scene from A New Hope. He then gave a reading from the recent C-3PO comic book that finally explained the red arm that has been on everyone’s minds since the film was released. The RC Experience was, in all honesty, not worth checking out. It was something a bit different, but unless you’re a huge fan of remote control helicopters it will pass without any wow factor. Sorry guys! The final panel of the day was a discussion between some of the concept artists behind the development of The Force Awakens. This was a really interesting one hour that I’m glad I attended. Hosted by, there were several artists involved in the discussions, including Doug Chiang (Executive Creative Director, The Force Awakens); Rayne Roberts (Lucasfilm Story Group); Phil Szostak (author, ‘The Art of Star Wars: The Force Awakens’). There were a few revelations. One image seemed to reveal that Rey used to be called Sally in an early stage of the film. It was interesting to hear how many ideas were scrapped along the way, but the artists didn’t seem to care about that and were candid in explaining their thought processes around each of their drawings. 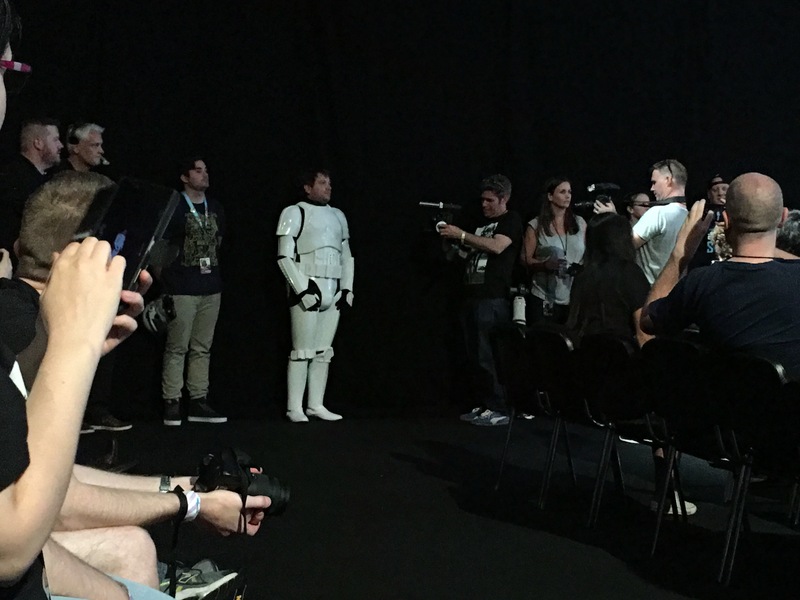 There was a surprise visit from Rogue One director Gareth Edwards, who were spotted looking uncomfortable in a Stormtrooper outfit throughout the panel. He asked a ridiculous question in a very broad northern-England accent (I think) and laughed as the panel looked on nonplused. A great moment! Mark Hamill surprised fans as we left by appearing on the Star Wars Show stage and entertaining guests until we were all ejected. A nice surprise given we were heading for the exit anyway! !